In a Chicago pizza joint last year, I joined four hungry locals in ordering a pizza from Lou Malnati’s, a classic Chicago chain. A deep-dish novice, I sat quietly outraged at what I thought was a rather prudish order of a single pie. At most, we could evenly divide the pizza into a slice and a fraction of another. It was only until halfway into my first slice that I had finally realized what everyone else at the table had grown up knowing: Chicago pizza is a beast. A lifetime of thin-crust preferences has led me to demolish slice after slice without thought, taking down minimally half a pizza order, depending on size. To have a starvation-level hunger smacked down by a single slice felt like an embarrassment. A couple of us made idealistic moves towards a second slice but despite our efforts we still walked away with leftovers. Deep-dish pie looks more like actual pie than the flatbread pizza of the rest of the world. Toppings are layered upside-down with a chunky tomato sauce keeping quiet the secrets of what lies below. Chicago-style pizza is all but overlooked in San Diego, but the spirit lives on strong in the few places that do champion the style. Berkeley Pizza is an oasis from the soulless clumping of restaurants and bars tourists so lovingly refer to as the Gaslamp District. They bait the hot mess of drunk fools and hoards of clubbers roaming the streets with a chill vibe, respectable lineup of beers, late hours, and pizza by the slice. Berkeley Pizza has recently cast a net in North Park, a fresh pond of drunk fools, with a new location posted up between Coin-Op Game Room and The Office. It was from here I ordered a couple slices, a classic pepperoni and their signature combo of spinach & mushroom, to be whisked home between two paper plates for a pairing. 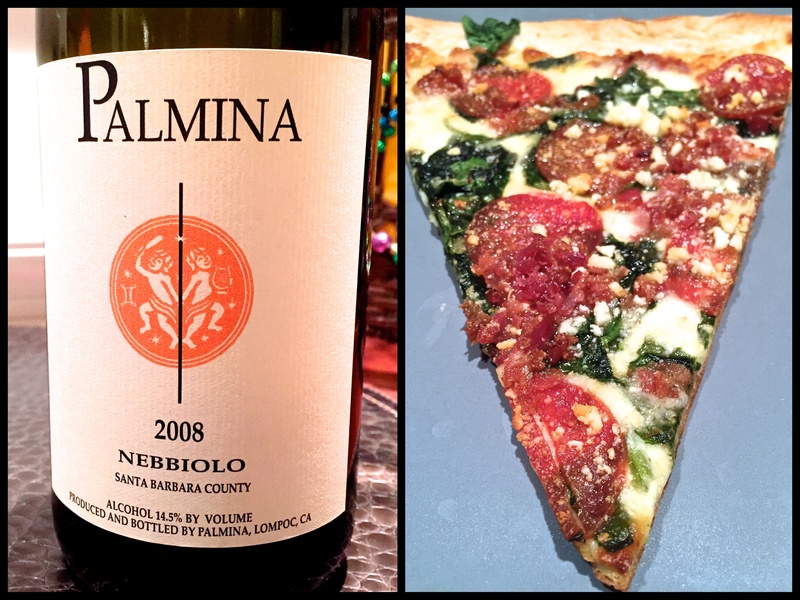 Such a rich and robust pizza requires a rich and robust wine to match. Acidity is also important so to the Old World we go, specifically the Rhône Valley in southern France. Once a papal summer palace, Châteauneuf-du-Pape is a Southern Rhône region that produces red wines made from a blend of up to 13 different varietals, with Grenache at its core. Châteauneuf-du-Pape is one of Robert Parker’s favorite styles of wine, which he prizes for its immediate parade of “intellectual and hedonistic elements” that generally takes great age-worthy wines decades to develop. Robert Parker reflects this same attitude in many of the wines chosen for high scores on his 100-point scale, providing consumers looking for those ripe and approachable styles a shortcut in research. While I dabble in the other end of the stylistic spectrum these days, I began my love of wine with juicy, sun-humped wines of the New World and moved away only to explore other styles for education purposes. Though I never returned, I can always enjoy a plumped up red, hedonistic and generous with fruit. Hedonistic is right. The 2012 Domaine de Saint Siffrein (Châteauneuf-du-Pape) opens up hot and lush with stewed berry aromas of raspberry and blackberry pie on a backdrop of matted earth and dried leather. With just enough acidity to balance the wine’s weighty presence, the Châteauneuf-du-Pape is bold enough to handle the monster punch of flavor divvied out in each bite. Meanwhile, the tomato sauce is alive, racy with acidity, fighting an internal battle with globs of cheese and thick, buttery crust threatening to overwhelm the senses. Shockingly, the crust is sturdy enough handle the lasagna of weight above and all can be managed without a fork and knife. 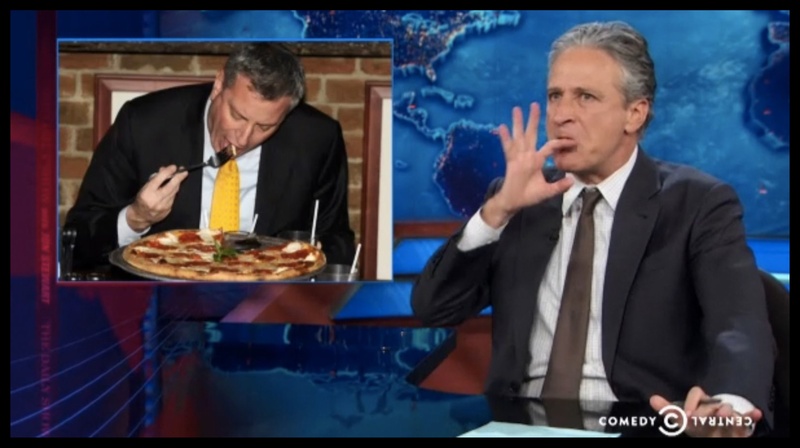 And thank the pizza gods for that, lest we disappoint Jon Stewart. 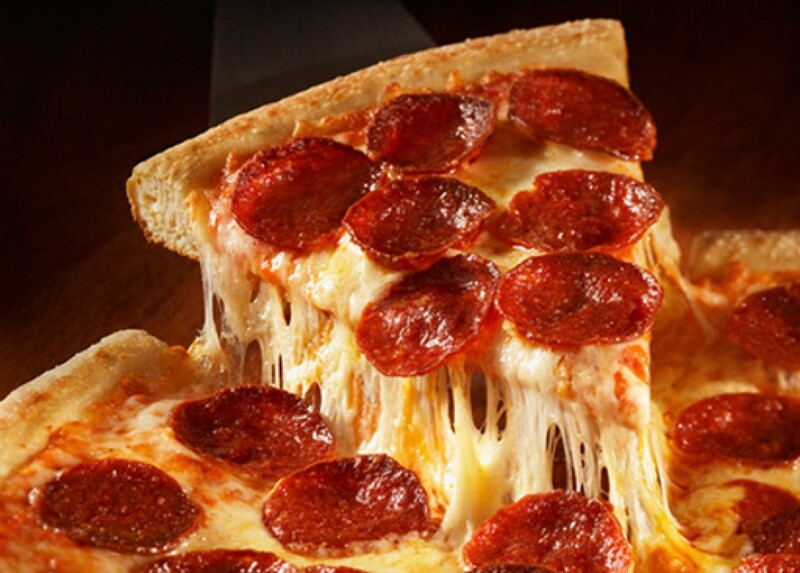 With all toppings drenched beyond recognition with pizza sauce and cheese, there is almost no perceptible difference between the two different slices except for the intense animal charisma and lingering spice brought on by the pepperoni. The spiciness, while subtle, doesn’t bode well for the Châteauneuf-du-Pape as perception of alcohol, considerably elevated for an Old World wine, is exacerbated by spiciness in food. In the wake of this realization, I reach for a different bottle of the same region in France to play nice with the pepperoni slice. In the neighboring Northern Rhône, red wines showcase Syrah almost exclusively, where the varietal displays aromas of cured meats, olives and leather with black pepper and a medley of dark berries. The comparatively cooler climate of these northern vineyards offers up a bit more acidity to their fruit, and allows for leaner alcohol levels in wine while keeping a firm and powerful frame. Some of the most classic representations of Syrah come from small regions such as Cornas and Hermitage. 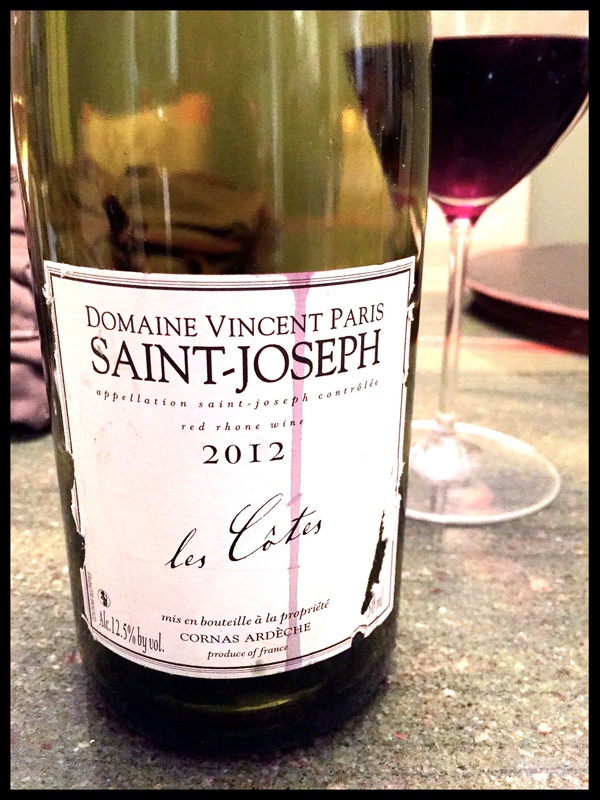 Though variable in quality as the largest appellation of Northern Rhône, St. Joseph is stylistically similar at a fraction of the cost. The nose on the 2012 Domaine Vincent Paris (St. Joseph, les Côtes) is rich with a sense of copper and rust with raspberries on the palate. The leaner alcohol and higher acidity allow the meat and pepper aromas to play amongst its flavor companions in each bite. 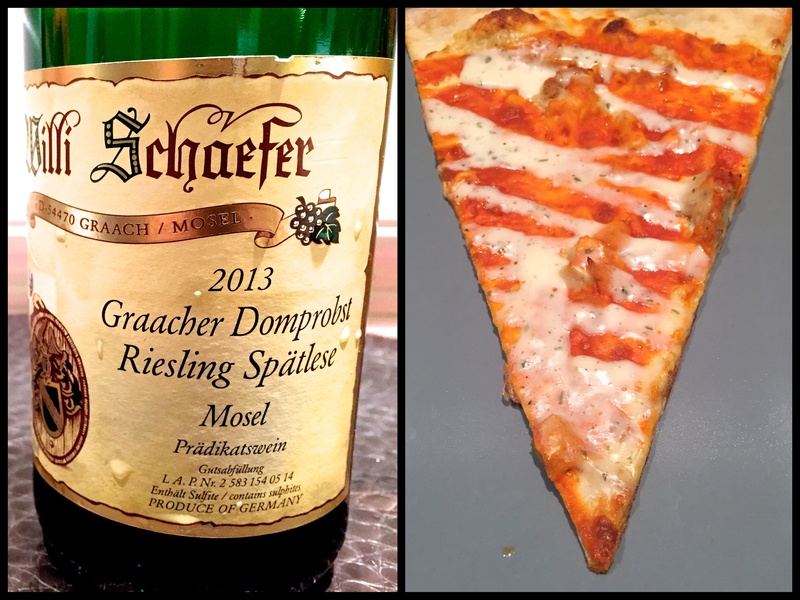 The story ends happily, with the signature pie finding a dance partner with the Châteauneuf-du-Pape while the pepperoni slice took the spotlight with St. Joseph pulling off coordinated dance moves too good not to have been choreographed ahead of time. 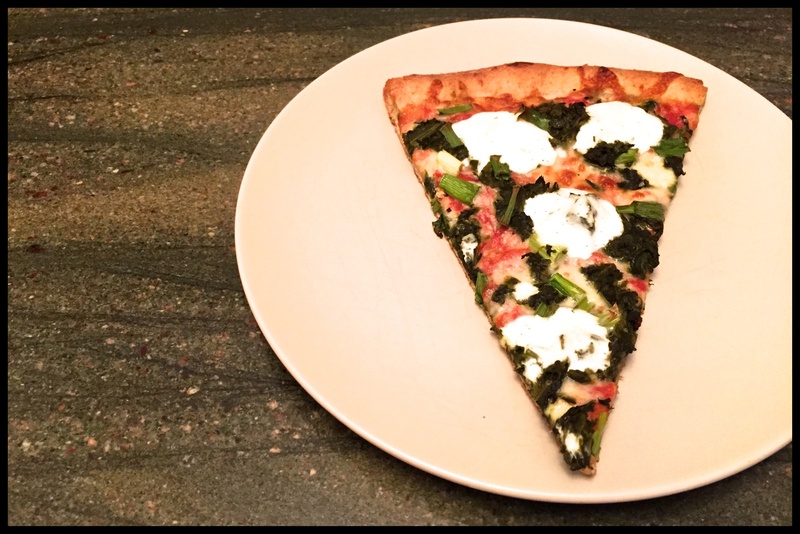 Within a quiet stretch of blocks on the Kensington side of Adams Avenue sits an airy neighborhood pizza joint called The Haven. Of the selection of specialty pies featured, a small circular feast named Popeye catches my eye and the recommendation of the employee that day. The white pizza boasts an irresistible lineup of roasted garlic topped with chicken, mushrooms, fresh spinach, mozzarella and goat cheese. Squiggly lines of sweet aromas radiate from the pizza box as a combination of baking spices and roasted garlic creep into the nostalgic territories of my senses and stir up some hunger. The swaths of garlic, caramelized into a candied sweetness, is a welcomed fiesta instead of an intrusion on my palate. With a salty, almost briny quality to the pie, there is no want for extra cheese. Overlaying the medium-thin chewy crust, chunks of chicken and fleshy mushrooms make up the bulk of textural layout. Chicken may at first seem to play an integral role in any dish when in actuality the protein generally bows to any sauce or strong flavor present, the same way a neutral grape varietal such as Chardonnay can showcase terroir or a winemaker’s influence with clarity. 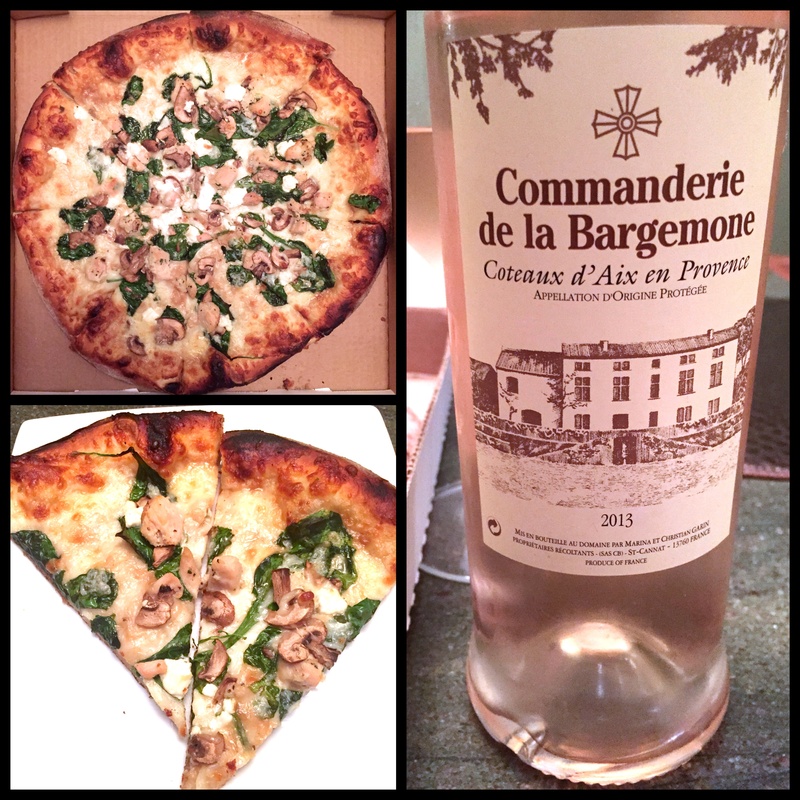 The mix of aromatic and vegetal pizza aromas allows for a dry rosé to swoop in and play hero. Our hero today is a Provence rosé, 2013 Commanderie de la Bargemone of the appellation Coteaux d’Aix en Provence. Provence is a region in southern France dedicated to dry styles of rosé that will quickly win over any drinker’s taste buds when paired with light cuisine or a sunny day. Don’t let those pretty hues fool you: not all rosés are sweet. Not even slightly sweet. 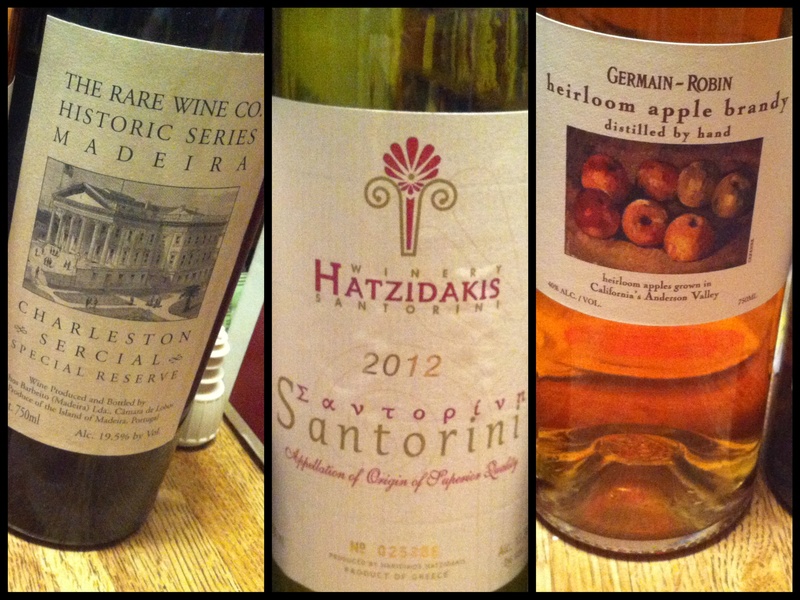 Most styles of rosé found in the wild are dry, especially when taking on a global perspective beyond the grocery aisle. Fruity aromas in wine tend to distract from sweetness level, making it easy to confuse the ripeness of fruit detected on the palate for the sugar level of the actual juice in the glass. Similar they may seem, only the latter is referring to actual sweetness as opposed to the perception of sweeter flavors. This particular rosé is pretty close to bone dry, keeping fairly intense notes of tart strawberries and floral rosy aromas. Provençal rosé is especially refreshing when chilled down to refrigerator temperature, a low preferable for simple and crisp beverages. 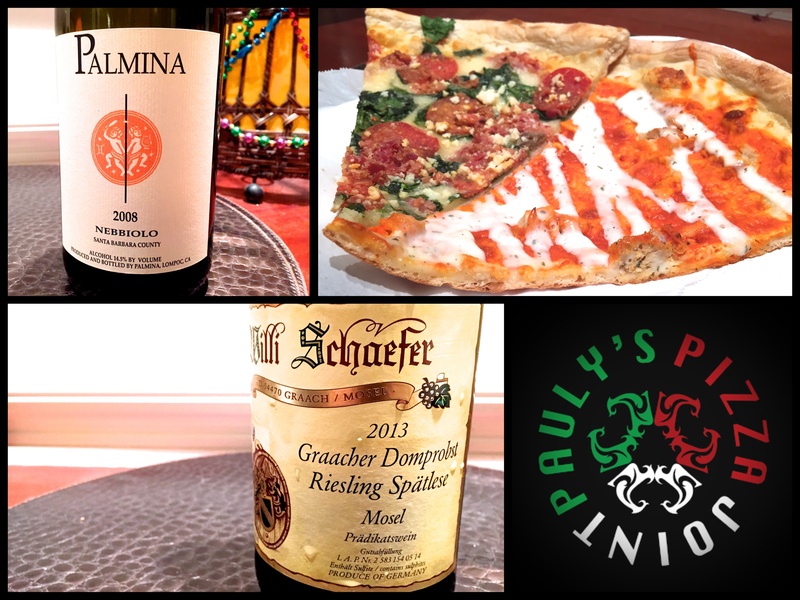 The rosé beside the pizza’s earthy aromas and boisterous, tangy flavors make for an uncomplicated yet all-encompassing pairing. Come salad or ham sandwich, carpaccio or root vegetable, rosé is generally well equipped to wrangle a range of flavors into a composed pairing. It is best to keep it stocked at all times. Always. 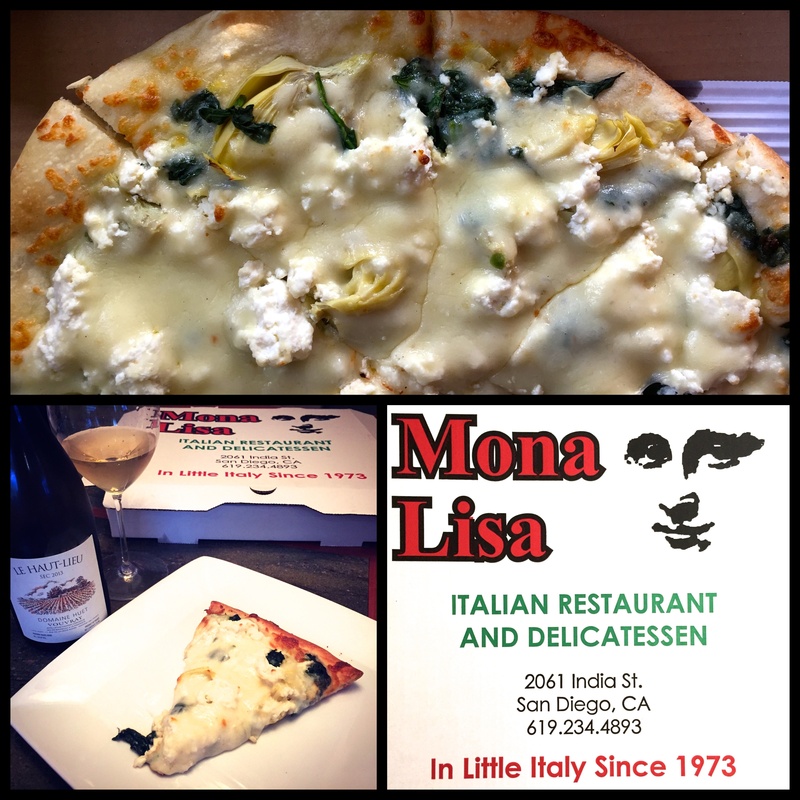 Mona Lisa is an Italian market, deli and restaurant prized for keeping harder-to-find goods like white anchovies, fresh pasta, and Italian amari. Having contemplated the deli-section artichokes with hungry eyes, I opted for Pizza Bianca, a white spinach pie, with the addition of artichokes. Expectations for a delicate, light pizza were shattered upon its arrival. An entire atmosphere of mozzarella with puffy clouds of ricotta engulf the toppings below making this pie look intimidatingly rich compared to original expectations. Surprisingly, the crust maintained a thin and crispy base with a doughy upper layer that unified well with the pillowy topography above. Each bite was like a lunar exploration, never quite knowing what might be unearthed from within the rocky cheesescape. 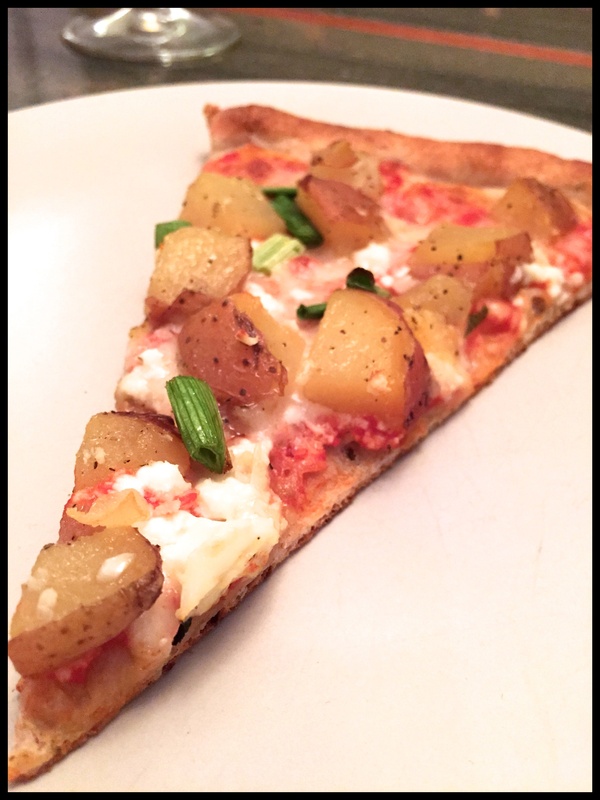 When given the task of pizza topping, artichokes offer some tangy relief that regulates super cheesy situations. As the main representative of spring on the classic Four Seasons pizza, artichokes have a long-standing relationship with Italy, where its cultivation is the highest worldwide. Even still, artichokes are notoriously frustrating to pair with wines, requiring a tart, acid-driven white wine to offset the organic acid known as cynarine that makes everything taste sweeter. With a geeky weakness for acidic, mineral driven whites, I plucked a bottle of Vouvray to pair, no problem. Vouvray is a French wine region of the Loire Valley producing medium-bodied whites made entirely of Chenin Blanc. The style rewards in its complexity, displaying a wide range of aromas spanning from quince to cheese rind, wet wool to chamomile. 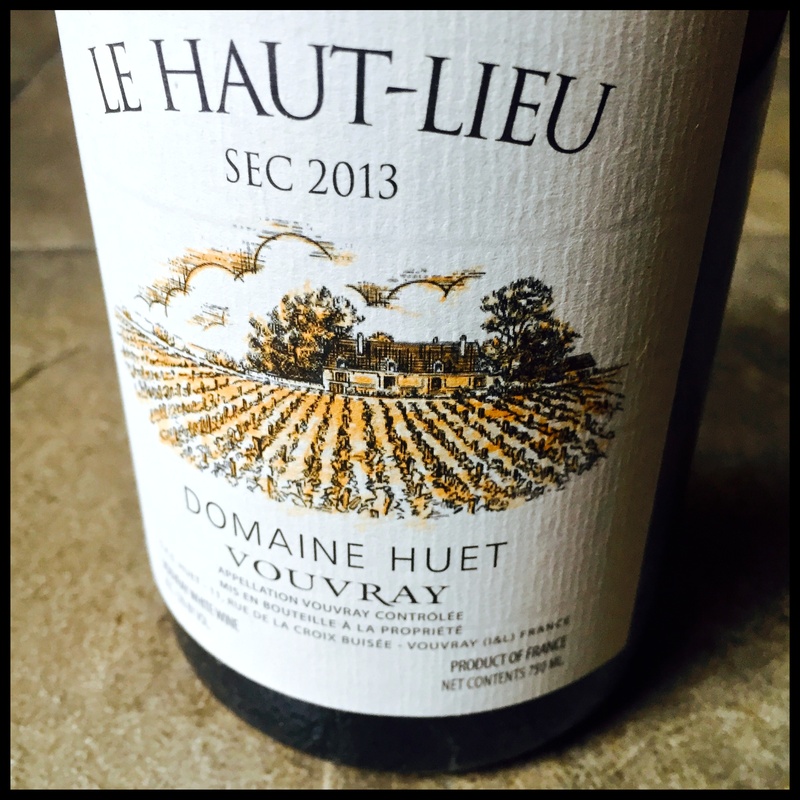 2013 Domaine Huet Vouvray Le Haut-Lieu Sec is youthful and dry with notes of citrus peel, wet asphalt and bruised yellow apples. For a pizza burly with cheese, Vouvray offers a vibrant backbone to the experience, refreshing enough for intensely creamy bites and dry enough to stand up to the sweetening effects of the artichokes. 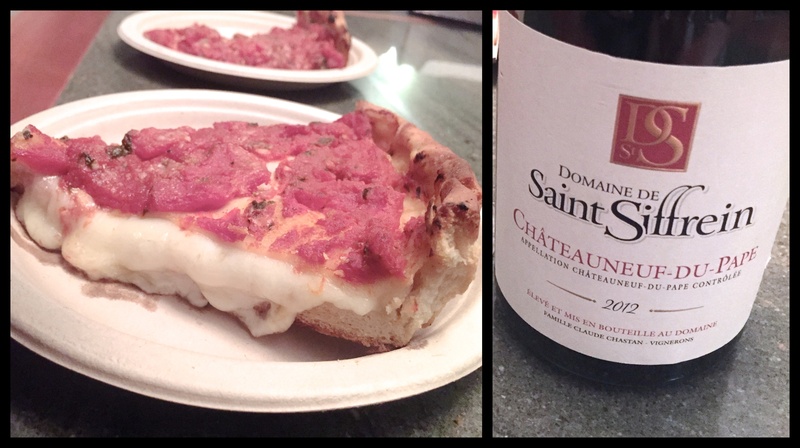 Vouvray has long been my number one homie, but now we’re officially pizza homies. the perks of dating within the pizza world. There’s nothing pizza can’t fix. Bad night? 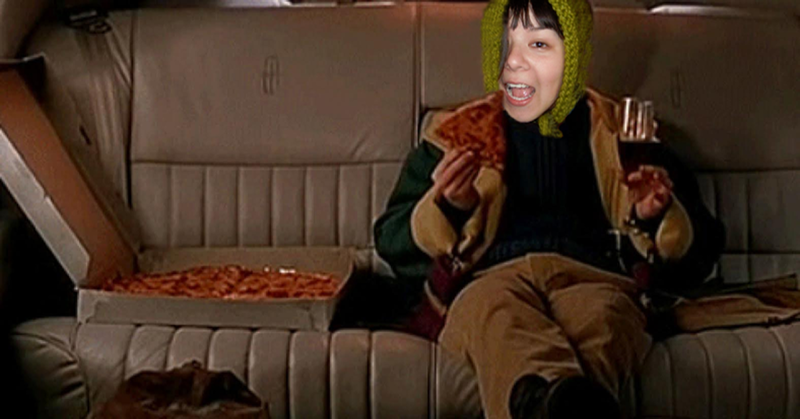 Order a pizza. Broken heart? Go eat some pizza. Broken bones? Pizza certainly can’t make it worse. Burned the roof of your mouth on lava-hot cheese? Muster up a minute’s worth of self-control, then resume eating pizza. From the first pop of the cardboard briefcase keeping warm the pizza within, all the ugliness encountered since your last slice disappears. The cure-all effect is especially potent if the pizza encounter is unexpected, which happens to me with some regularity with my SO working at URBN, a New Haven coal-fired pizza joint. After one particularly grueling night, a surprise from the pizza gods/a dutiful boyfriend landed a few wild slices of URBN’s Gouda Garlic Alfredo on my countertop. With a fresh shipment of goodies from Hi-Time Wine Cellars, I pounced at the chance to revisit labels from the recent booze haul in order to best select a pairing. A boon to any wine & spirits enthusiast in Southern California, Hi-Times is an incredible resource for bottles to get excited about, both well within and way out of any normal price range. With every opportunity to do so, I gladly drain my bank account to shop their shelves and stock up on hard to find wines. San Diego can be a challenging city for us wine geeks; it’s tough enough to track down a bottle of Sherry or Barbera, but even the mildly obscure (Assyritiko, Godello or Uruguayan Tannat) are practically nonexistent. Keeping a double-entranced, multi-room cellar, Hi-Times is where to turn to satisfy wine curiosities and discover new styles yet untallied, such as the Beaujolais Blanc (Domaine Des Terres Dorées, 2011, $16) plucked for this pairing. The southernmost region of Burgundy, Beaujolais is best known for light and fruity reds made entirely from the Gamay grape. Styles range from flirtatious, bubblegum Beaujolais Nouveau first popularized in the 1970s for its youthful attributes to more age-worthy, darker representations cultivated from the granite hillsides of Beaujolais Cru. Even those familiar with Beaujolais may not have known a white counterpart existed, and for good reason: the region is practically a monoculture of Gamay. Though a rarity, Beaujolais Blanc does exist in small quantities, requiring 100% Chardonnay. 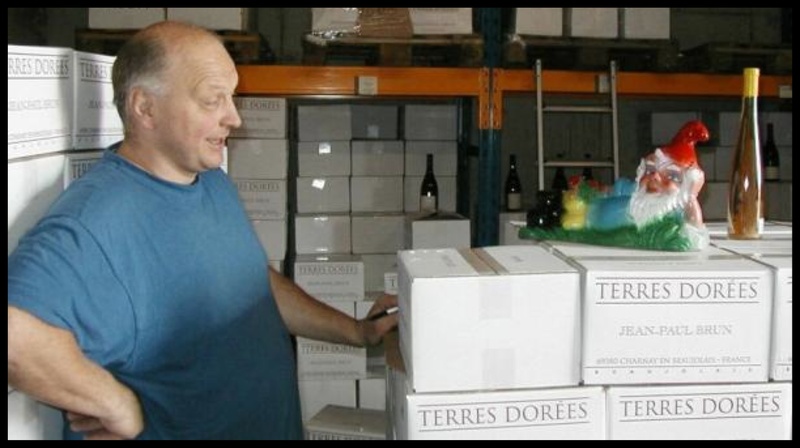 Owner and winemaker Jean-Paul Brun began Terres Dorées in 1979, converting his family farm into an estate. From 10 acres of vines, Brun first produced Beaujolais Blanc, eventually expanding his vinicultural repertoire as his vineyard holdings increased. The now 40-acre estate still dedicates half its plot to Chardonnay, providing a stellar representation of what the grape is capable of without the fuss of getting dolled up. Unlike many weighty, over-oaked styles of Chardonnay especially common among cougar populations, the pristine varietal expression of this wine kept it light on its feet, dancy and alive. An attractive chalkiness on the nose was further emphasized by a wet limestone palate. Under-ripe apple and tart lemon contributed to the wine’s fresh liveliness with hints of a nutty bitterness and slight waxiness rounding out the texture. With a name deserving to belong on an Olive Garden menu, the Gouda Garlic Alfredo is surprisingly light, with chicken, spinach and sun-dried tomatoes driving the true flavor profile. Tomato acted as the diva of the bunch, bursting with personality and juicy, concentrated musk while the gouda was shy with just a twang of nuttiness. Even the garlic was subdued by the soft vegetal tones brought on by the greens. And chicken was there being chicken, offering texture and support to all its more flavorful companions. Unfazed by any smattering of red pepper flakes or garlic undertones, the Beaujolais Blanc drove the midnight snack forward with each sip invigorating the palate for more. 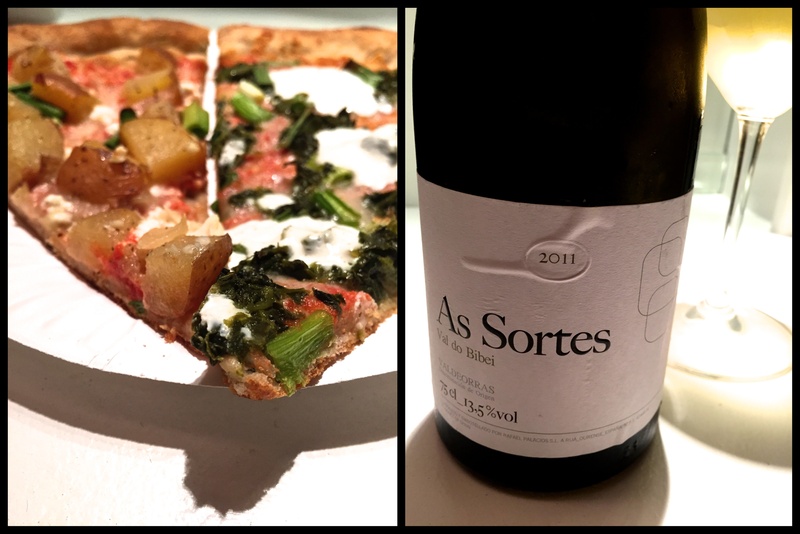 And so it goes, the pizza was reduced to mere crumbs and crust, concluding this pairing adventure with one momentous realization: Beaujolais Blanc is rad.